Also Recommended: Just...any magical girl anime other than this. ANY of them. Even Wedding Peach. ANYTHING is better than Futari wa Pretty Cure. Notes: There is a manga based off this anime, which is currently running in....Nakayoshi. Why am I not surprised? 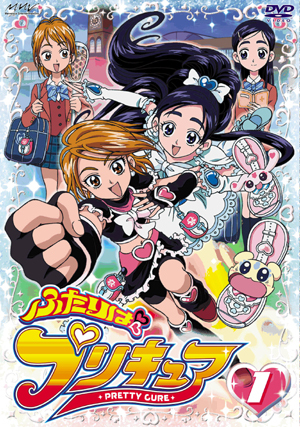 Editor's note: Toei is also offering the two first episodes of PreCure, subbed, on the IGN Direct2Drive service. This offer is only available to North Americans and Canadians, though. The whole series is also available to watch on Crunchyroll's website at www.crunchyroll.com. Misumi Nagisa and Yukishiro Honoka are both ordinary students at the Verone Girls' Middle School. Nagisa is a tomboy who loves sports and hates to study, and Honoka is one of the top students, who appears elegant, but is actually very clumsy (gee, where have I seen this before?). One night, two strange creatures, Mipple and Mepple, fall from the sky and meet Nagisa and Honoka. They tell them that the bad guys have taken over their planet, the Garden of Light, and want seven mystical jewels so that they can control the world. (*snore*) Mipple and Mepple give the girls magical talking cell phones (!) with them inside, and the power to transform into Cure Black and Cure White, so that they can protect Earth from the evil monsters (ZzZzZzZz...). Can Nagisa and Honoka fight together even with their different personalities? Will the Earth be saved? Will doinkies ever make it through this show? I have seen many magical girl anime, folks. I've watched Sailor Moon and Cardcaptor Sakura and Tokyo Mew Mew and Ultra Maniac and Hime-chan's Ribbon and Saint Tail and Creamy Mami and Full Moon o Sagashite and I have liked most of them. I've even liked Mermaid Melody Pichi Pichi Pitch, of all things. But this anime is just plain doinky. It may even be worse than the doinkiest of the doinky magical girl anime, Wedding Peach. Just what makes this series so terrible? Many, many things, including the plot. The plot is horribly cliched. It uses all the plot elements we have come to expect from a post-Sailor Moon magical girl anime, and it doesn't put a twist on any of them. We have our generic bad guys, the Dotsuku-Zone, who take over the generic utopian happy land, the Garden of Light, and they want to steal the generic magic jewel (in this case, seven mystical jewels) from the generic utopian happy land. It's all ripped directly from Sailor Moon, and they don't even try to hide it. And the transformation method is also stupid. In order to transform into Cure Black and Cure White, Nagisa and Honoka have magical talking cell phones. Let me repeat that again: MAGICAL TALKING CELL PHONES. And they have to swipe a card through them to transform. I am not kidding. The transformation scenes take forever and a day to complete, and the attack names are some of the worst ever. "PreCure Marble Screw"? "PreCure Rainbow Therapy"? Hearing these attack names, I wondered if the scriptwriter had serious issues, because only a doink could come up with an attack name like "PreCure Marble Screw". About the only thing that is original about their fighting is that they use martial arts instead of wands or sticks. Unfortunately, this is probably the only original thing in the entire series. The monsters that they fight are even stupider - they fight monster-ized household appliances, including...vacuum cleaners. (Shades of Jewel BEM Hunter Lime.) Only a doink could have thought up such doinky monsters. Recommended Audience: This anime has virtually nothing objectionable in it, except for the massive ripping off of better shows and the horribly annoying mascots. This is suitable only for the little girls who this series was targeted to in the first place.